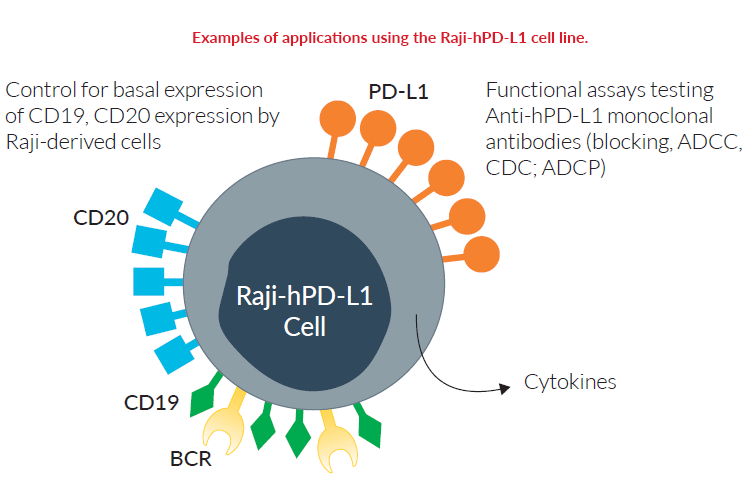 Examples of applications using the Raji-hPD-L1 cell line. 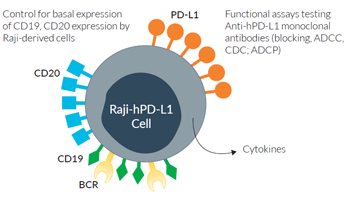 Raji-hPD-L1 cells were developed from the human Raji cell line. Raji cells have been successfully used as target cells in human effector studies such as antibody-dependent cellular cytotoxicity (ADCC), either with peripheral blood mononuclear cells, Natural Killer cells, or Jurkat-derived reporter T cells. PD-L1 (programmed cell death ligand 1; also known as CD274 or B7-H1) is a transmembrane protein expressed at the cell surface of hematopoietic and nonhematopoietic cells, and is induced by pro-inflammatory cytokines, such as in the tumor micro-environment . PD-L1 is one ligand for PD-1, an inhibitory immune checkpoint receptor that is expressed by activated and exhaused T cells. PD-1:PD-L1 interaction induces inhibition of T-cell receptor signaling, thereby preventing T-cell overstimulation and host damage . Comparison of ADCC potency for native and engineered anti-human PD-L1 antibody isotypes: Raji-hPD-L1 cells were incubated with gradient concentrations of Anti-hPD-L1 or Anti-β-galactosidase (β-gal) mAbs for 1 hour. 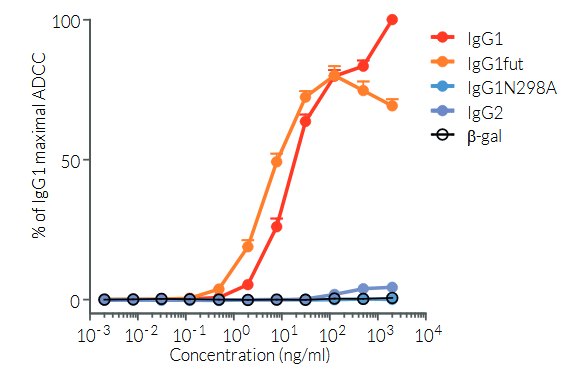 Jurkat-Lucia™ NFAT-CD16 effector cells were then co-incubated with targets cells for 6 hours. NFAT activation, reflecting the induced ADCC response, was assessed by determining Lucia luciferase activity in the supernatant using QUANTI-Luc™. Percentages of the maximal response normalized to the IgG1 isotype are shown. Human PD-L1 expression has been verified by flow-cytometry. Induction of antibody-dependent cellular cytotoxicity (ADCC) has been validated using InvivoGen’s anti-hPD-L1-hIgG1 antibody and Jurkat-NFAT Lucia™ CD16 reporter cell line. Raji-hPD-L1 cells are guaranteed mycoplasma-free. 1 vial of Raji-hPD-L1 cells (3-7 x 106 cells) in Freezing Medium.